You know Starbreeze. They've made sturdy, sometimes spectacular shooters like The Darkness, the Chronicles of Riddick games and this year's Syndicate. Usually, when the Swedish dev studio announces a new game, you usually expect highly stylized sci-fi violence and clever, satisfying gunplay. Their newest game doesn't have any of that. And it looks wonderful. Brothers: A Tale of Two Sons springs from the vision of filmmaker Josef Fares. The downloadable game tells the story of two boys looking to find a magical cure for their father's fatal illness. The game comes across like something out of Grimm's Fairy Tales or a Hans Christian Andersen story, what with those wonderfully lush forests and ye olde European style of dress. And, look, some sort of helpful troll! 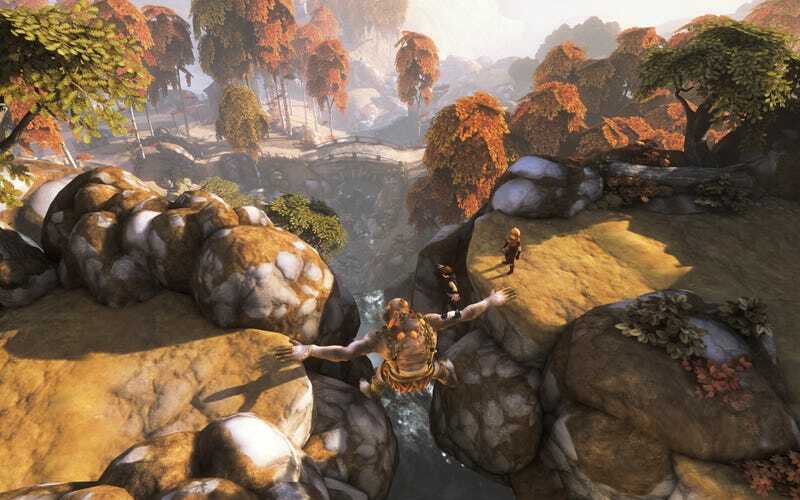 Brothers looks like an intriguing shift from Starbreeze's last few efforts and I'm definitely looking forward to it, especially since it reminds me a bit of Papo & Yo. Look for it to hit PlayStation Network, Steam and Xbox Live next spring.